Born: 31 December 1856, Kirkton of Mailler, Perthshire, Scotland. Died: 6 August 1947, Cape Town, South Africa. William Thomson, mathematician and university administrator, was educated at the University of Edinburgh, where he was awarded the degrees Bachelor of Science (BSc) and Master of Arts (MA) with honours in mathematics and natural philosophy (physics) in 1878. That same year he wrote a substantial article on "Mensuration" (the science of measurement) for the ninth edition of the Encyclolpaedia Britannica. After some years as assistant in the Department of Mathematics at Edinburgh he succeeded George Gordon* in January 1883 as professor of mathematics and natural philosophy at Stellenbosch College (later Victoria College, which became the University of Stellenbosch in 1918). He soon added a course in electricity and magnetism to the syllabus. In June 1887 he resigned for health reasons, but was reappointed the next month. From the beginning of 1892 he was professor of mathematics only. He also became a member of the council of the University of the Cape of Good Hope in 1883, holding both positions until 1895. In 1884 he married Annie Catherine van der Riet, with whom he had two daughters. Thomson's publications included An introduction to determinants (Edinburgh, 1881), Algebra for the use of schools and colleges (London, 1886), A text-book of geometrical deductions (with J. Blaikie; London, 1891-1892), and Elementary algebra (London, 1901). In 1887 he was an examiner in mathematics for the University of Edinburgh. In June 1895 Thomson gave up his academic career and succeeded Reverend James Cameron* as registrar of the University of the Cape of Good Hope - an examining body and the only university in southern Africa at the time. He served in this position until 1918, when the institution became the University of South Africa and moved its headquarters to Pretoria, and continued as registrar of the latter until his retirement in 1922. During this period he served as secretary of the Inter-Colonial Conference on University Education in 1908, as chairman of the Higher Education Commission of 1911, and as a member of the University Statutes Commission in 1916. From 1895 he was a member of the South African Philosophical Society for a few years, and from 1902 a member of the South African Association for the Advancement of Science. Honorary Doctor of Laws (LLD) degrees were conferred upon him by the University of Edinburgh (1904) and the University of Cape Town (1922) and he was elected a Fellow of the Royal Society of Edinburgh. He was knighted in 1922 for his contribution to tertiary education in South Africa and the next year returned to Scotland. In 1924 Thomson represented the University of South Africa at the conference on university education of the League of the Empire in London. In October that same year, following the resignation of J.H. 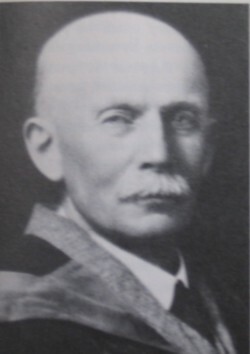 Hofmeyr as principal of the University of the Witwatersrand, he agreed to return to South Africa to fill this post until a permanent appointment could be made. This only happened early in 1928, when H.R. Raikes was appointed. Thomson also resumed his services to the University of South Africa as a member of its council from 1924 until his death in 1947. After his final retirement he lived in Simonstown. Boucher, M. Spes in Ardus: 'n Geskiedenis van the Universiteit van Suid-Afrika. Pretoria: Universiteit van Suid-Afrika, 1973. Be Bruyn, G.F.C. Professore: Universiteit van Stellenbosch en voorgangers. Kaapstad: Nasionale Handelsdrukkery, 1989. Encyclopaedia Britannica, combined 9th and 10th ed., 1875-1902. South African Philosophical Society. Transactions, 1897-1898, Vol. 9, 10: Lists of members. South African who's who, 1927/8, 1936, 1946. University of the Cape of Good Hope. Calendar, 1884/5 - 1917/8.